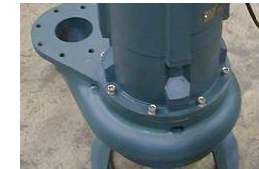 Four circumferential casing vents connect the mechanical seal chamber to the sump ensuring that the motor mechanical seal arrangement is never exposed to pressures in excess of submergence depth x slurry density. Our unique dual seal chamber flinger arrangement works in concert to provide continuous, low pressure fluid circulation thus flushing and preventing solids build up in the mechanical seal chamber. This arrangement also automatically supplies a minimum flow bypass port for shut valve conditions.